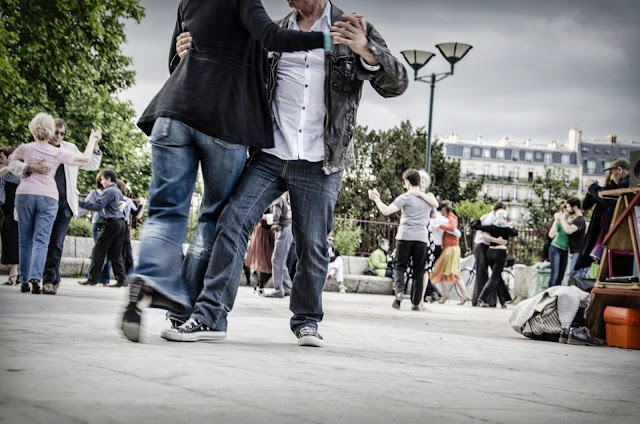 ParisDailyPhoto: Not the last tango in Paris! Not the last tango in Paris! Along one part of the embankment in the 5th arrondissement, there are several amphitheaters that are used for several purposes (exhibitions, picnic areas...) including, in summer - and providing it does not rain ! - dancing sessions. All sorts of dance are represented including the Tango, like in this photo that I took just before my departure to Nice. All this is entirely free, of course. More info (in French) here. I am so busy at the moment that I could hardly dance but it must make things really nice and people be positively happy. Too bad we can't see their face. They surely were smiling while dancing, enjoying themselves. Looking at them dancing can also be a pure simple treat, while enjoying the embankment. Have a nice Suunday! Don't know about you, but this makes me want to dance (in Paris, of course)! Oh I love this, Eric. But then you know I love the tango and photographing it! Great shot. Virginia once posted a series on Tango dancers in Paris. I wonder if it was the same place. Ooh, that looks like fun. :) I want to learn! I"ve connected with one of the regular tango dancers. She found her photo on my blog from 2009!! We have corresponded with each other and she tells me where they will be popping up. Apparently the city of Paris has made it hard for them. I can't wait to meet her one day. Looks like fun! Your photo captures the spirit of the dancers well.